Victory was second consecutive win in six-furlong test for son of More Than Ready. 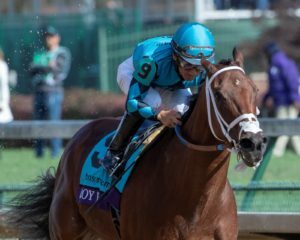 Less than two hours after Peter Miller sat down in the Breeders’ Cup press room to field questions about his two-time Breeders’ Cup Turf Sprint (G1T) winner Stormy Liberal Nov. 3 at Churchill Downs, the California-based trainer was back in the hot seat. Click here to read the article from BloodHorse. Smiling for the camera during his second round of interviews, Miller expressed his appreciation for TwinSpires Breeders’ Cup Sprint (G1) victor Roy H.
Though the field for this year’s Sprint was almost identical to last year’s, the start was considerably more bumpy for Roy H. The 6-year-old More Than Ready gelding hit the wall of his stall in post 9 at the break and wobbled briefly before he could be righted by jockey Paco Lopez. Promises Fulfilled set the pace on the inside rail but soon faded to second as Roy H found his stride and punched the gas on the outside. Running on cruise control four wide on the outside, Roy H took command to hit the half-mile mark in :44.21. Straightening out as the field turned for home, the defending winner kept pounding away at the ground, extending the margin from a half-length to three lengths at the top of the stretch. Rallying from last after drifting at the start, Whitmore cut a path through the pack up the middle in a last-ditch effort to run down the leader as they approached the wire. Moving with the same speedy clip that earned him the title of champion sprinter last season, Roy H never faltered, crossing the wire 3 1/4 lengths ahead of Whitmore in 1:08.24. Saturday’s win marked milestones for trainer and jockey. Lopez earned his first victory in the Breeders’ Cup, and Miller became the first trainer to saddle back-to-back winners of the same two races in the 35-year history of the Breeders’ Cup. Runner-up Whitmore was followed by favorite Imperial Hint in third. Promises Fulfilled took fourth, 5 3/4 lengths ahead of Limousine Liberal in fifth. B Squared, Distinctive B, Warrior’s Club, and Always Sunshine completed the order of finish. Impressive enough on its own, the win was made even sweeter for Miller and owners Rockingham Ranch and David A. Bernsen, who went through the loss of their promising sprinter Bobby Abu Dhabi who was reported to have died during training at Del Mar from fractures to vertebrae in his neck, which occurred because of a fall as a result of sesamoid fractures in his right front leg. 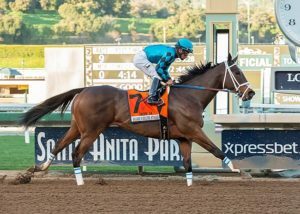 Bred in Kentucky by Ramona S. Bass out of the multiple graded stakes-winning Elusive Quality mare Elusive Diva, Roy H was purchased for $310,000 by Rockingham Ranch from the Wavertree Stables consignment to the 2014 Keeneland April 2-Year-Olds in Training Sale. He holds a 9-5-2 record from 22 starts with total earnings of $3,019,765. “He’s a teddy bear,” Miller said, the emotion evident in his voice. “He’s a love. He just loves to be pet on and loved on. He’s a pleaser. You know, he’s given me more than I could ever give him.